In many Asian traditions the full moon in Autumn is considered the most beautiful of all full moons and from that a culture of hosting parties to gather and admire the moons beauty at this time of year emerged. It is a traditional festival I've always admired, so now that my husband and I are settled into our own house we thought it a good festival to host ourselves and make something of our own from it. 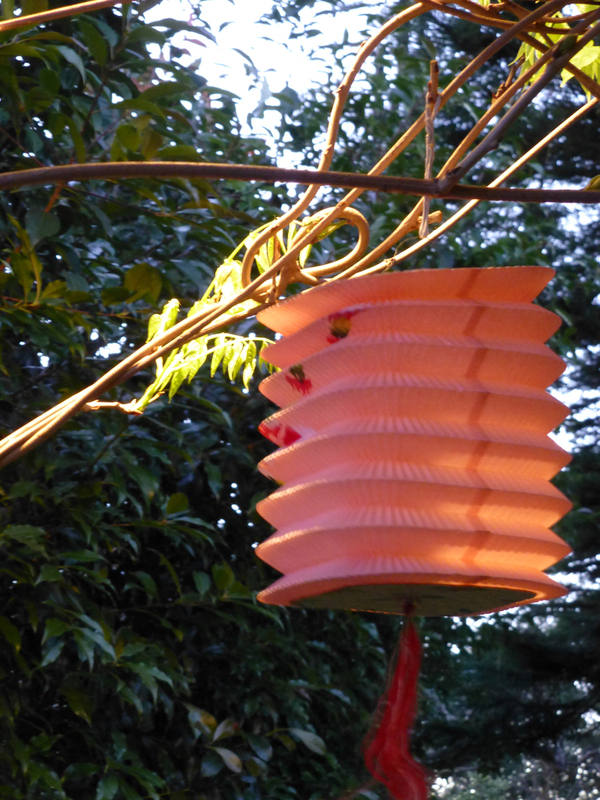 The lanterns we strung up came from both our mothers. The silky round ones are new from Geoff's mother for the occasion and the paper concertina ones are an inheritance from my mother, who has had them since her childhood as Christmas decorations. Both styles complemented each other nicely and we even found some old nails already in place and bits of wisteria vine to be useful hanging hooks. In Chinese culture the moon festival is characterised by a gathering of family and friends partaking of a banquet and eating moon cakes. For our moon festival we were joined by Geoff's family and his best friend, Johnny and his wife Rosanna and their two little ones. For our feast I cooked drunken chicken, char-sui pork, a vegetable dish that represents the three treasures of ivory, jade and gold and something called "good-luck spring rolls". They proved that good luck isn't always easy to come by as they were very tricky to make, you start with a simple enough fish and prawn mince paste but then you need to roll it in bean curd sheets, steam them, dip in egg and breadcrumbs then fry. I admire anyone who can handle the bean curd without it cracking into a multitude of shards because it is too dry or clumping and disintegrating into soggy shreds because it's too wet. I managed to pull together enough pieces to make a batch of misshapen parcels that tasted nice enough, those that managed to stay in one piece throughout the entire process that is. In Japanese culture the moon festival is often represented by the image of a rabbit in front of a full moon. Just after we were engaged Geoff and I travelled to Japan and were there around early Autumn and saw much of this imagery in our travels, picking up a few things too such as the cloths we used to line the tables with. They make a nice dialogue with the moon cakes. The moon cakes themselves are traditionally made of a white lotus paste with a preserved salted duck egg yolk in the middle to represent the full moon. These days you can get different varieties also, so alongside the traditional we also sampled pandan, durian, chrysanthemum, green tea and even an "espresso chestnut" flavour. Moon cakes are made in patterned wooden moulds and the outside cake batter holds the pattern extremely well making them very pretty indeed, almost to the point of not wanting to eat them but then thats why you take a photograph before you take the cake knife to them. Finally our little moon festival wasn't complete without a small twist courtesy of some Arabic sweets from Johnny and Rosanna. Its fair enough to say that in our house all cultures can come together and mingle and these sweets were delicious with their spongey cake tops and bottoms filled with a sweet creamy custard and sprinkled with pistachio nuts. The table set with chopsticks, moon cakes and Arabic sweets.